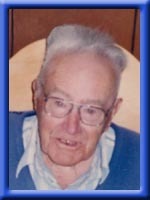 J. Lawrence Tarr, 92 of North Queens Nursing Home, died February 5, 2010 at Queens General Hospital in Liverpool. Born in Western Head, Queens County, he was the son of the late William Herbert and Annie Estella (Frelick) Tarr. He was a veteran of World War II, serving in the Netherlands. Lawrence was a fisherman for a number of years, both with his own vessel and then with other boat owners. He was employed as a carpenter working for his brother Bill. Lawrence could tell stories about his younger years, remembering stories about his family and the other residents of area. He could tell stories about the local rum running during Prohibition and funny stories about the first car in Western Head and how it scared the horses. Lawrence liked being in the woods and knew the local area so well that the local surveyor would ask him about property lines. He was an avid gardener who continued to plant and share a vegetable garden until he loss his vision. He is survived by his daughter Esther (Kevin) Doggett, White Point; son in law Richard Ward, Western Head. Grandchildren: Kimberly Doggett, Saint John NB; Adam Doggett ,Bridgewater NS; Arthur Doggett ,White Point, Sally(Kendall) Karlsen, Liverpool; Laura Ward ,Western Head . Great-grandchildren: Savanna and Kierra Karlsen, Liverpool. Sisters: Mrs. Evelyn Naugler, Ontario; Mrs. Nellie Carter, Ontario. He was predeceased by his wife, Marion E. Roy; beloved daughter Shirley A Ward; brothers Arthur, Morris, William (Bill) and Bruce; sisters Dorothy Myra, Thelma Ross, Alice Hartlen, Ethel Hartlen and Gladys (in infancy). We were sorry to hear about Lawrence. Our thoughts and our prayers are with your family. Thinking of you Esther, and your family at this difficult time. so sorry for your loss.our prayers are with you. dear ester and family i am so sorry to hear of uncles passing .i remember being a little girl and i always loved coming to their house on sundays with nanny roy we always had lots of fun.if there is anything i can do please give me a call 356-2549.you and the family are in our prayers. We were sorry to hear of Lawrence’s passing, he will be fondly remembered by us. Nancy Anthony, Jordan Myra and Aleta Rafuse. So sorry to hear about Uncle Lawrence. Our prayers are thoughts are with you and family. So sorry to hear of the passing of my Great Uncle Lawrence. My prayers and thoughts of with you and the family. We just found out today, I was searching Chandlers obituaries and saw that he had passed away. Our thoughts and prayers go out to Esrher and her family and also to Richard Ward and his family. Our Deepest Sympathy to the Family John L will be greatly missed R.I.P you are home at last in heaven . Our thoughts and prayers are with you all during this difficult time! God was sent yet another angel! You will be sadly missed but never forgotten! You will always and forever be in our heart! Ester and Family sorry to hear about John Lawrence. Our thoughts and prayers are with you all at this difficult time. Ester and family: Sorry to hear about Lawrence,,, my thoughts and prayers are with you at this time. To Esther and family ,we are so very sorry to hear of Lawrence’s passing.Our thoughts are with you all at this time.